When to sail Greece - the Greek sailing vacation season - yacht charters and sailing vacations Greece. The yacht charter season in Greece starts early April and ends in November. The graph below deals with all tourists, not just the sailing tourists. 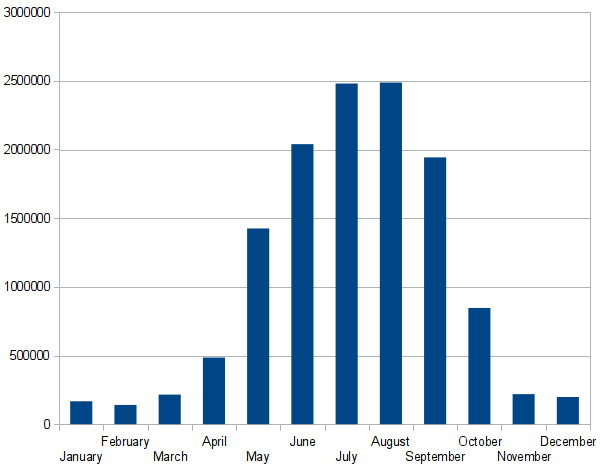 Yet a graph for just yacht charters will no doubt spike even more in the sailing high season, which runs from the last week of July till the first week of September. The most crowded sailing areas will be Corfu, Lefkas and the Saronic. You will also find a lot of non-sailing tourists on the popular islands of Mykonos, Ios, Santorini, Kos, Rhodes, Lesvos, etc. In the Aegean Sea the strong Meltemi could not only be a nuisance but also a hazard for sailors. Yacht charters will be about 10% more expensive. You will have more choice of cabin charters, flotillas and charter flights. All tavernas, museums, mineral baths, etc will be open. An abundance of flowers & lush and green islands due to the spring rains of March. This particularly concerns the Cyclades and Dodecanese, which will gradually turn dry and barren during the high yacht charter season. Despite losing some of its freshness and most of the flowers, the Ionian and Northern Aegean islands will remain green and fertile throughout the whole sailing season. Cheap yacht charters: the high - and most expensive - season starts last week of July and ends after first week of September. Before May even cheaper. Fewer charter yachts; even when arriving late in the afternoon there will be ample space in ports and anchorages, yet most tavernas are already open. In the Ionian the Maistro already delivers steady reliable winds much like in the Aegean where there are no strong Meltemi winds yet. Orthodox Easter : The next Easter Sunday will be on April 4th, 2010 , and is the biggest church holiday in Greece, traditionally celebrated with sumptuous amounts of wine and the roasting of a quite a lot of lambs. Ascension is 40 days after Easter and Pentecost is 50 days after Easter. 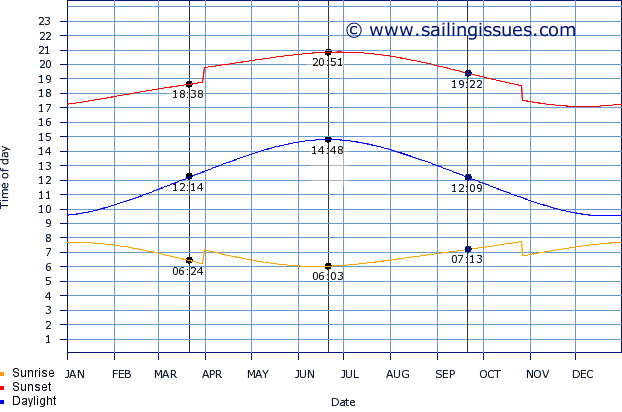 As is shown in the graph below, daylight hours peak in 21 June - the summer solstice - with 14 hours and 48 minutes. On 21 September the day is 2 hours and 39 minutes shorter, yet even as early in the sailing season as 21 March the day is longer, albeit by just 5 minutes. The “spikes” correspond to daylight saving time. The water temperature will reach “pleasant swimmable” levels in May (19-21 °C) but in April the sea temperature is usually just 16-18 °C, in my view a bit chilly. Fortunately, this rapidly improves to a very pleasant 23 °C (74 °F) in the beginning of June. See all seawater temperatures maps per month. All this considered, I have found the optimum to sail Greece to be around the last two weeks of May and the first two weeks of June. If snorkelling and swimming at beaches and anchorages is important, the whole month of June is ideal. Again fewer yachts and tourists: Especially in the popular areas of the Ionian Sea and around Athens the amount of tourists will drop dramatically after the first week(s) of September. Still steady winds in the Ionian (Maistro wind) and no Meltemi winds in the Aegean. Cheap yacht charters: the high - and most expensive - season usually ends after the first week of September (some companies a week earlier or later). And with the start of October even cheaper. Seawater with tropical temperatures, ideal for swimming at beaches, snorkelling at anchorages and diving: 28-30 °C (83-87 °F). Typically the Cyclades can suffer from shortages of fresh water: except for Naxos none of the cycladic and dodecanese islands have perennial rivers and are therefore already rather barren, dry and rugged in the yacht charter high season. Also, for (charter) yachts it will be more difficult and expensive here to fill the water tanks. Yet, the northern Sporades and the Ionian islands stay green and fertile all year round, but are even more beautiful in springtime when covered in colourful flowers. A slight but significant increase of (meltemi) storms, heat waves and forest fires in the high season. Also see the IPCC 4th Assessment Report on Greece.